The Vixen Series 4 sports car. As a result of the redesigned chassis, the body of the Vixen Series 3 fitted easily onto the new M-Series chassis, which meant that the production life of this variant could be extended by a further year. Consequently, now designated the Series 4, it was now introduced in 1972, and was fitted with the Ford 1.6 litre engine, as used in the Ford Cortina GT saloon, which developed 86 bhp at 5500 rpm. 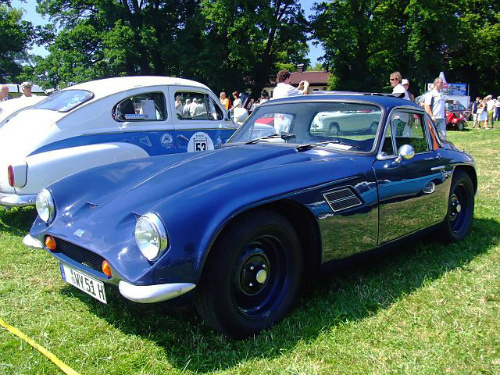 The Series 4 used the TVR M-Series chassis with the Vixen body shell, but apart from this, there were no significant mechanical or styling changes between it and the Series 3. In 1973, the Vixen Series 4 was phased out in favour of the TVR 1600M, the first of the M-Series, which incorporated the restyled chassis. With 22 units of the Series 4 built in 1972, and just 1 in 1973, the total production finally reached 23 units. An interesting fact was that a Series 2 Vixen had a 0-60 mph time of 10.5 secs, and produced a top speed of 109 mph, which was 4 mph faster than the TVR 1600M, which replaced the Series 4 in 1973. In 1972, the Vixen 1300 was launched, and targeted the market sector featuring what was classified as "economical" cars. Fitted with two SU carburettors, it was powered by the 1296 cc, 4-cylinder engine as used in the Triumph Spitfire, which developed only 53 bhp at 6000 rpm. With its unimpressive performance, only 15 units were built by the end of that year, of which the last 6 were fitted with the M-Series chassis. Furthermore, even though the very last of these 6 units utilised the M-Series body as well, it was not classified as a 1300M, which might have been expected. In 1971, a variant of the Vixen sports car was launched that was powered by the non-injection version of the 2.5 litre, 6-cylinder engine, as used in the Triumph TR6, which had already cleared US emission control regulations for this particular engine variant, as opposed to the injected version. Designated the Vixen 2500 in the US, the last 96 units were fitted with the M-Series chassis and Vixen body. Production ended in 1972 after a total of 385 units had been built. The Vixen range was one of TVR's most successful models, when around 400 units were built before being phased out in 1973 in favour of the M-Series. In reality, all that really changed between 1967 and 1973 was the name, since everything else was virtually unchanged, apart from the engine size. Built following the restructuring of the company in 1965, the TVR Vixen range of cars was probably the most influential in terms of generating financial stability within the company.